CLIFFORD POIRIER, ANITA POIRIER, BERNARD OHNEMUS, PATRICIA OHNEMUS, CHARLES RYBERG, MARIE RYBERG, LURENE WENTWORTH, DENNIS SULLIVAN, DEBORAH SULLIVAN, JOHN WENEKUS, JOAN WENEKUS, WILLIAM FOLEY, JUNE FOLEY, EDWARD KAZINOCKA, MARY KAZINOCKA, EDWARD LUPINSKI, ALICE LUPINSKI, PAUL BRADY, ELIZABETH BRADY, LEONARD ISAACSON, BARBARA ISAACSON, [Note 1] ANN BERGIN, FRANK DORIGATTI, CATHERINE DORIGATTI, PHILIP PAGLIAZZO, JOSEPH TROMBLEY and BARBARA TROMBLEY vs. MARK ROGERS, ROBERT J. CORMIER [Note 2] and PUTNAM REALTY CORP. This is a complaint for a declaratory judgment pursant to General Laws Chapter 231A brought by certain residents of Waltham against Putnam Realty Corp. (and others), a corporation owning real estate on Woodlawn Avenue and off Dale Street in Waltham in the County of Middlesex which seeks a determination that the defendants have no fee interest nor easement to use Woodlawn Avenue and prays for the issuance of an injunction permanently enjoining the defendants from using Woodlawn Avenue. The complaint also sought a determination that the plaintiffs had a right to use Woodlawn Avenue, but the Court declines to rule on this issue since it is not presently in dispute. In addition, some of the plaintiffs do not appear to have such a right if in fact Woodlawn Avenue is a private way. Indeed there is a serious question as to whether many of the plaintiffs have standing to bring this complaint, but since some of them do, the Court has not pursued this inquiry. The plaintiffs also raise a question under the subdivision control law, but since they failed to exhaust their remedies pursuant to G.L. c. 41, §81BB, the Court will not consider their claims thereunder. Finally, the plaintiffs originally objected to use by the defendants of Putnam Street, but the Amended Complaint seeks no relief in this respect. The defendants contend that Woodlawn Avenue is a public way or alternatively that there is appurtenant to locus the right to use Woodlawn Avenue, if indeed it remains a private road. A trial was held at the Land Court on June 16, 1989 at which a stenographer was appointed to record and transcribe the testimony. Witnesses included Michael Delaney, a Land Court title examiner who testified for the plaintiffs and Ernest D. Rogers, the brother of the defendant Mark Rogers, and with his wife the proposed purchasers of one of the houses in dispute. Thirty-five exhibits were introduced into evidence which are incorporated herein for the purpose of any appeal. 1. The defendants Putnam Realty Corp. ("Putnam") acquired title to Lot 2 on a plan entitled "A Plan of Land in Waltham, MA" dated August 29, 1988, by V.T.P. Associates, Inc., Newton, Massachusetts, containing, according to said plan, 21,004 square feet, recorded as Plan No. 1667 of 1988 by deed of the defendants Mark Rogers and Robert J. Cormier dated November 2, 1988 and recorded at Middlesex South Registry of Deeds on January 30, 1989 (Exhibit No. l). Lot 2 had been a part of a larger parcel of land with a house thereon, fronting on Dale Street and numbered 275-277 Dale Street. 2. The premises at 275-277 Dale Street were owned by members of the Rogers family having been conveyed to Ernest J. Rogers and Marie Helen Rogers by Marion H. Hodges, Executrix by deed dated November 6, 1962 and recorded in Book 10160, Page 206. One of the boundaries as described therein is "a private way known as Putnam Street" (Exhibit No. 16). Title to the southwesterly portion thereof, shown as Lot 1 on said plan, is still held by members of the Rogers family who occupy the house thereon. The portion conveyed to Putnam had been acquired by Rogers and Cormier from Mr. Rogers' parents, Ernest J. Rogers et ux, by deed dated November 13, 1984 and recorded in Book 15815, Page 48 (Exhibit No. 17). 3. Putnam is a corporation in which Mark Rogers and Robert Cormier hold the controlling interests and the two houses now under construction of which the plaintiffs complain will be occupied by the two Rogers brothers and their families who grew up in the Dale Street home. A third house on Woodlawn Avenue was conveyed to William Ho et al by Putnam by deed dated May 31, 1989 and recorded in Book 19853, Page 176 (Exhibit No. 30). 4. Putnam acquired title to Lot B (and Lot A as well) shown on a plan dated April 30, 1988 (Exhibit No. 20A) from Charles Wilson, Jr. et al by deed dated April 2, 1988 and recorded in Book 19067, Page 87 (Exhibit No. 2). 5. Putnam then held title to Lot 2, Lot A1 [Note 4] and Lot B1 and adjusted the boundaries thereof, originally by a plan dated March 13, 1988 and recorded as Plan No. 1792 of 1988 (Exhibit No. 21) on which were shown Lots 1, 2 and 3 with adjoining frontage of the latter two lots of approximately twenty feet on Woodlawn Avenue. A second plan dated September 21, 1988 and recorded as Plan No. 1793 of 1988 moved the boundary line of Lot 2 to the south to accord with the foundation location with the result that Lot 3's frontage	on Woodlawn Avenue now abuts Putnam Street (Exhibit No. 22). 6. Putnam Street has never been constructed and is a so-called paper street. It is part of a subdivision shown on a plan entitled	"Forest Edge in Waltham, Mass. A Well Restricted Subdivision owned and developed by Benjamin Wellington et als", dated June 30 by Rowland H. Baines et al and recorded as Plan No. 130 of 1936 (Exhibit No. 23). None of the land owned by Putnam is situated within Forest Edge. The deed to Mr. and Mrs. Rogers in 1962 did bound by Putnam Street, but in the intervening years there has been no prescriptive use thereof, and the deed reference alone is insufficient to establish such a right. 7. The plan of Forest Edge shows a Woodlawn Avenue which logically would intersect at its southerly end with Woodlawn Avenue shown on Exhibit No. 22, but in fact the two ends of the road have never been extended to meet. The most southerly segment on which the land of the defendants abut dead ends at Putnam Street. However, there is a footpath joining the two segments, and people frequently walk over one part to reach the other and sometimes have so travelled by vehicle. 8. No subdivision plan was ever prepared of that portion of Woodlawn Avenue which runs from Dale Street to Putnam Street. Alfred Tomlin appears to have been the owner of three acres of land in this location, and the predecessors in title to both Putnam and some of the plaintiffs (See Exhibit No. 28). Deeds out from Mr. Tomlin refer to Woodlawn Avenue, but there are no early plans of it in the record, and how it technically was created remains a mystery. 9. 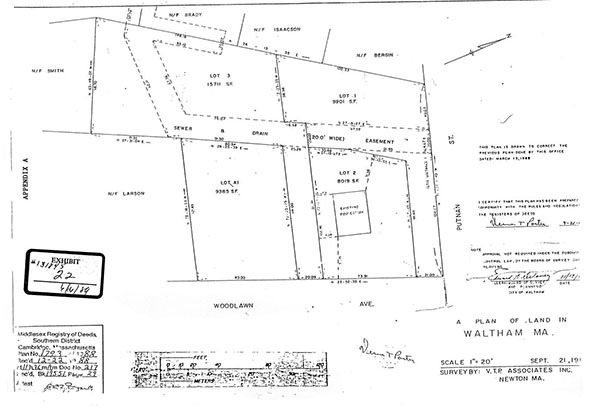 The City of Waltham has taken a sewer easement in Woodlawn Avenue in which a sewer has been constructed and to which some residences have been connected. The Court assumes that there also is city water servicing the homes on said avenue. The residents arranged to have the surface paved in the late 1960's to a width of about twenty-five feet. Otherwise, the City plows the street, sweeps it and provides maintenance in accordance with the provisions of Section 17 of the General Ordinances of the City of Waltham which relates to private ways. The ordinances define a private way as "any way which is not a public way but which has been opened to public use for six (6) years or more" (Exhibit No. 24). There are street lights located on Woodlawn Avenue. The City has erected a street sign at the junction of Dale Street and Woodlawn Avenue which does recite that Woodlawn Avenue is a "Pvt. Way" as well as "Not A Thru Way" (Exhibit No. 33). There is also a hydrant on the street. 10. For many years Woodlawn Avenue has been used by those in the neighborhood to reach adjoining areas, by children as a playground and by the abutters for access to and egress from their homes. The owners have the benefit of city services, and the street seems indistinguishable from a public way. 11. There are three separate chains of title to the properties whose owners are concerned in the present litigation. There is no common owner at least in this century, and the titles seem to have evolved separately. The major issue in this case is the ability of Putnam to use Woodlawn Avenue for access to and egress from Lots 1 and 3, as shown on Exhibit No. 22, a copy of which is attached hereto as Appendix A, and Dale Street. The partis have agreed that Lot B1 has the right to use Woodlawn Avenue for all lawful purposes and that title thereto extends to the middle of the street. Therefore there is no disagreement that Lot 2 on Appendix A has such an appurtenant right as do those portions of Lots 1 and 3 which originally formed part of Lot B1. It follows that the owners from time to time of Lots 1 and 3 could park their cars on that part of their land which lies easterly of the division line between the Tomlin land and that fronting on Dale Street since the right to use Woodlawn Avenue runs with each part of the locus to which it is appurtenant. In effect, therefore, the plaintiffs are requesting the Court to rule that by driving to the rear of the reconstituted lot and into the garage the defendant and its successors in title would be overburdening the easement. Technically that may be so, but such a result would be one which would hold the law up to ridicule, and I decline to make it. In general, it may be said that an existing way in a city or town in this Commonwealth is not a "public" way - that is, one which a city or town has a duty to maintain free from defects (see G.L. c. 84, §§1, 15, 22; First National Bank v. Woburn, 192 Mass. 220 , 222-223 ) - unless it has become public in character in one of three ways: (1) a laying out by public authority in the manner prescribed by statute (see G.L. c. 82, §§1-32); (2) prescription; and (3) prior to 1846, a dedication by the owner to public use, permanent and unequivocal (see Longley v. Worcester, 304 Mass. at 587-589; Uliasz v. Gillette, 357 Mass. at 104), coupled with an express or implied acceptance by the public. Because the 1846 statute put an end to the creation thereafter of public ways by dedication and acceptance (Loriol v. Keene , 343 Mass. 358 , 361 ), it has only been possible since that time to create a public way by a laying out in the statutory manner or by prescription. In Fenn it was held that there was insufficient evidence to establish that the general public had acquired a prescriptive rtght to use the road in question as distinguished from a rightful use by those who have permission to travel over the private way. The rule of Fenn as applied to the facts in that case have not been universally accepted, even by Middleborough town officials. In the present case the homes on Woodlawn Avenue have all the amenities and city services of those fronting on a public way, but nonetheless, while it has been used to some extent by members of the public, its principal use unquestionably has been by the abutters and their invitees. Where it is a comparatively short street and dead end, it is difficult to conclude that is has become public by prescription. On all the evidence and with Fenn in mind, I am constrained to rule that there is not a preponderance of the evidence to support the conclusion that the general public rather than those visiting the home owners or their tenants made the greater use of the avenue. For that reason I reluctantly conclude that it has not become a public way. It would seem a mere technicality, however, for the City at this stage to take the street as a public way. In conclusion I decline to rule as to the rights of the plaintiffs who own land abutting on Woodlawn Avenue to use the way since there is no dispute. I call attention, however, to Certificate of Title No. 103288 in which an appurtenant right is set forth as evidence of the Court's prior ruling in part in this area. I further find and rule that there is appurtenant to so much of Putnam's land as lies southeasterly of the southeasterly line of the "Sewer & Drain (20.0' wide) Easement" shown on Exhibit No. 22, the right to use Woodlawn Avenue for all purposes, that this being so any harm to other abutters by granting the right to terminate access on, and to start egress from, the rear portion of Lots 1 and 3 is de minimis and no injunction will be issued. The plaintiff made several requests for findings of fact and rulings of law, but I do not treat each of them individually as I have made my own extensive findings. [Note 1] The Isaacsons do not object to the use by the defendants of Woodlawn Avenue and have been dismissed as parties. [Note 2] Messrs. Rogers and Cormier conveyed the premises in question to the corporation during the course of this action. A portion of the locus is subject to a mortgage to The Cooperative Bank of Concord which is not a party to this litigation and is not bound thereby. [Note 3] Any recording references herein are to the Middlesex South District Registry of Deeds. [Note 4] Lot A1 has been conveyed by Putnam to a third party by deed dated August 8, 1988 and recorded in Book 19255, Page 158.